Categories: Adoption Fiction, Adoption Memoirs. An anthology of 100 lively, informative articles on all aspects of adopting from China. The voices in Passage are fresh, direct, and informed. Read original research by Kay Johnson and her Chinese colleagues–the world’s top authorities on adoption and abandonment in China. Get advice from renowned physicians Dana Johnson, Jerri Ann Jenista, and others who specialize in international adoption. Enjoy personal accounts from adoptive parents about the joys of adopting and the challenges and triumphs of parenthood. The writers–adoptive parents and adoption and medical professionals from across the United States, Canada and Britain–discuss the process up close and personally, from the emotionally charged period of waiting to adopt, through the adoption journey, settling in as a new or enlarged family, specific issues of health and development in young children adopted from China, the special rewards and challenges of adopting children over the age of one and of single parenting, perspectives on adoption from China from inside and outside the adoption community, the loaded issues of culture, language, identity, and race, accounts of going back to China after adopting, and, finally, a look down the road of adoptive family life at issues that don’t come up in families formed the “usual” way. 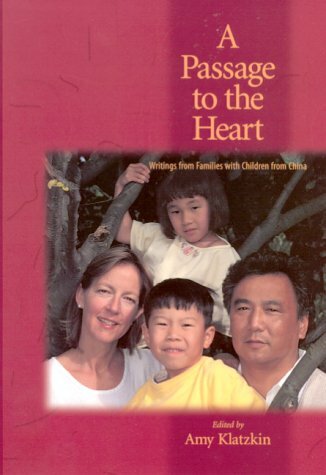 A Passage to the Heart: Writings from Families with Children from China is the collaborative effort of more than two dozen chapters of FCC and similar adoptive-family support groups in three countries. Each purchase benefits both the Amity Foundation (fccny.org/oaa.asp) and the Foundation for Chinese Orphanages (thefco.org), which have been working to improve conditions in Chinese orphanages since the mid 1990s.